Do you wonder how Frank Schilling prices domain names? What criteria he uses to value domains? And how much art versus science is involved? In this excerpt from a DomainSherpa Review, Frank Schilling discusses AMR (average monthly revenue) and ADT (average daily traffic), and why these two metrics make up only 20 percent of his domain name valuation methodology. Do you wonder how Frank Schilling prices domain names? What criteria he uses to value domains? And how much art versus science is involved? 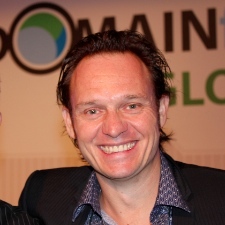 Listen in as Frank tells us which domains to drop and which he would swing for the fences on. Stay tuned. Frank Schilling: Great to be here. Thank you for having me. Michael Cyger: Frank, it is great to have you. Like we discussed right before I hit the record button, I want to know if you got your valuation chops going, or is it just Jeff Gabriel and the other team members that are pricing all the domains nowadays? So, we are going to. Frank: Hang on just one minute. Jeff is coming here, asking me for a price. One second. Michael: All right, and of course Jeff has been on a Domain Sherpa Review in the past, so we know he has got his chops all honed up. Frank, I asked you right before the show, “Do you have everything you need for the show, since this is your first time. Do you look at the EstiBot data that we provide, which has the number of advertisers, the number of search volume, and the cost-per-click,” and you said to me, “I only have two criteria, Mike.” Right? Frank: Right. I do not use any of that stuff. Michael: So, you have been domain investing for a couple of years, Frank, as I see in your Wikipedia page. What do you do for valuing domain names? Frank: So, some of it is basically built-in knowledge. You just know. Okay, you understand the keyword weight and the gravity of the name, and that is very touchy-feely. That is the art of the domain name. And I would say it is really 85 percent art and only 20 percent science that goes into domain names. You have to look at it. You have to feel it. There are names that are just transcendent. You know them when you hear them. You have seen them. You have been in the industry long enough. These things come around like Halley’s comet. You would be like: “Oh, I saw this 30 years ago. I remember this.” I have a good long-term memory, but the two criteria I use that are more technical, the math of it, the 20 percent that is not art, that is more science are something that we in-house call AMR and ADT. And that is average monthly revenue on PPC and average daily traffic. ADT and AMR. And so, average daily traffic: how many uniques a day is this name getting on average? And that could be on many names. That is only a fraction of a unique a day. It just did not level type-in traffic, but it is a very good tell as to the resonance and gravity of the name and how strong it is in hearts and minds of people. And then, on AMR, again, in the difficult, difficult, difficult days of PPC, when nobody is making any money with PPC, including yours truly, you can still get a (Unclear 2:24.2) level of what CPC is bringing, and that is a tell as to the amount of bidders. It kind of does a lot of what EstiBot does because, as you see a lot of ADT numbers over and over again, you get to kind of see. Oh, this one is higher than that one, and so on. You get to see patterns emerge. So, I use AMR and ADT as a guidepost, and then call on my years of experience because this is all I do every day. Michael: Yeah, sure, but let’s say that I am like every other investor out there. I have got a bunch of domain names. They do not make much. I do have my domain names parked at DomainNamesSales, InternetTraffic.com, and let’s say that one of my best names, let’s say, gets probably 50 uniques a day. Maybe earns one dollar or two a day for me. How would you use those two pieces of information to price that domain? Frank: Now, again, I said that is 20 percent of it is science. Would you mind sharing the name? Second, need a broker who’s eager to do whatever is required to sell your domain names regardless of price? Then you need to contact Houghton Richards. They specialize in exact match, keyword-rich, geo and new gTLD domain names, and they sell more than 1,000 a month. Visit HoughtonRichards.com and tell them the domain you want to sell today. Finally, if you’re buying a domain name from a private party and want to know what else they own, DomainIQ.com is the tool you should be using. View their entire portfolio, filter by Estibot value and be a better investor. $49.95 for 250 queries per month. Visit DomainIQ.com/portfolio to learn more. Michael: Sure. Diagnose.com, let’s say. Frank: Okay. Well, that is a terrific name. So, now you could see that the name has keyword weight and gravity, so you can see that is a real name. Somebody is typing that in. That is not mechanical or bought traffic. The name is not XR7-4, because that is a different type of name that would get that AMR and ADT footprint. Frank: But you see that it is really good that you bought that up and it is parked with us, so that you can see the AMR and ADT on it. 50 uniques a day tells me that Google is likely discounting that a lot or just not optimizing it well, because diagnose is clearly such a resonant keyword. And then, on the other hand, it could be that the drug companies do not want to advertise on the domain, and so they are discounting it, so it is not getting its full potential or oomph of what it could. Frank: But the ADT, the traffic is like off the chart. 50 uniques a day in a world where everybody is on apps and supposedly everybody is on YouTube and in the portals like Facebook and Twitter, 50 people are so passionate about diagnose that they would type the name into their address bar and end it with .COM every single day. That is a strong footprint and a great tell that you have an incredible name. So, you couple the 80 percent of art that it is a homerun name, and then you couple it with that signature of traffic and revenue, you can understand why the revenue is low and undervalued at the moment, so you just discount that and then you price it accordingly, based on its traffic and what the potential is. Michael: But 50 a day. How do you price a domain name based on the unique visitors if you know that the AMR is discounted for whatever reason? Your traffic comes from my site, Diagnose.net, in which case that changes the AMR and ADT signature and the art side of it as well. You still get to make a call at the end of the day as to where you think, and then you use other sales, your appetite for holding it till another buyer would come, and you kind of use all that and you weigh it, and it is a business like any other. You just make a decision as to whether you want to take the cash now or later. It’s good to see others using the Uni keyword too! :) Hoping to build out Uni.Directory into TLD and App directory. Let us know if you’re interested in a joint venture Frank! Great tips, seen this show before, always good to hear Frank’s thought process. Thanks for watching and taking a moment to post a comment, Noor. Much appreciated. Forgot to mention that the domain name FrenchRiviera.com is for sale by Ryan Colby. Michael, I know you did an interview of the person who purchased it. I was wondering maybe you can bring him or even Ryan back on the show to see why it is for sale. I reached out to Toby regarding the sale of FrenchRiviera.com (https://www.domainsherpa.com/toby-hardy-frenchriviera-interview/). It’s for personal reasons and doesn’t make sense to bring him back onto the show for an update. This is why I do my best to turn people onto your show. I wonder how Frank is doing with Uniregistry? Are there exceptions to the rule, of course and we have seen the interviews that Michael has done, where a domain name is sold for a lot more than purchased for within a year. What I am saying is that this is a very good side business to gamble with, but to make it a career is simply not being realistic unless you have some form of other income. so i finally gave up at $775 and he won it at $785. I’ll have to reach out to Frank and get clarification on their process. I’m sure there’s something to learn from it. Isn’t this an old interview? And too many advertisements for an 8 minute video. It is an excerpt, Dayne. You can read above the video and see a link to the full show. I hope you visit our sponsors and at least give them a chance of earning your business. It’s through their sponsorship that we’re able to provide the resources we do. Thanks for considering it. Thanks for the response Michael. I do have a subscription to estibot, use namejet, and escrow.com. They’re all great. Awesome, Dayne. I really try to have sponsors that I use and can vouch for, so I’m really pleased to hear that many of them are ones you use too. Thanks! Awesome video. I always love to learn from the great Frank Schilling! Frank, can I ask is there a translation of AMR and ADT to valuation? For example, if the AMR is $10 or $10, does that mean the domain name is valued at a certain level? Same question for the ADT at 1 or 10. I understand it’s only 20% of your valuation system. is it just me? .. can’t hear audio while playing on my iphone :? Another Great Show, Thanks Michael and Frank. Thanks, Jay. I appreciate you watching and posting a comment.